Moto India/Lenovo launched one of the company’s latest smartphone Moto G5 in India. The mobile will be available for purchase exclusively via Amazon.in. There are offers and exciting deals surrounding the device. Let us have a detailed look at all of that beginning with specifications. The smartphone sports a 5-inch full HD display at a resolution of 1920 x 1080 pixels and is protected by Corning Gorilla Glass 3. It is powered by 1.4GHz Octa-Core 64-bit Snapdragon 430 (MSM8937) processor with Adreno 505 GPU and runs on Android 7.0 (Nougat) out of the box. It has 13-megapixel primary camera with LED flash, PDAF, f/2.0 aperture, 1080p video recording and 5-megapixel front camera with OmniVision OV5693 sensor, f/2.2 aperture. The mobile is equipped with fingerprint sensor on board to provide an extra layer of security besides supporting 4G VoLTE, WiFi 802.11 a/b/g/n ((2.4 & 5 GHz), Bluetooth 4.2, GPS and Dual SIM connectivity features. 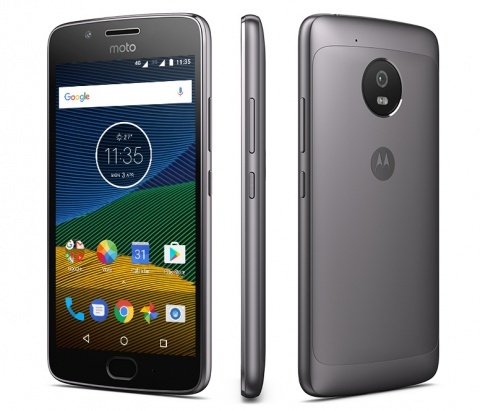 Moto G5 packs a 2800 mAh battery with rapid charging technology and weighs 144.5 grams with 144.3x73x9.5 mm size measurements. The smartphone will be available in Fine Gold and Lunar Gray colors at a price of Rs 11,999 exclusively via Amazon.in. The Amazon Prime members who’d buy the Moto G5 would get Rs 1000 in Amazon Pay Balance. Initial purchasers would also get 16 GB microSD card with the device. And for HDFC Credit Card users, there is an offer of Rs 1000 cashback.